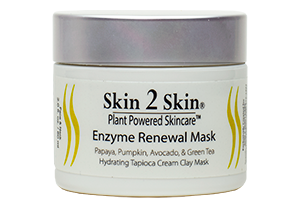 Skin 2 Skin’s Enzyme Renewal Mask is a unique clay mask that incorporates a special active Papaya Enzyme in a rich creamy texture that renews and smooths the surface of the skin. The avocado oil is an anti-oxidant, rich in vitamin B2, D, A, E and K that moisturizes and hydrates to soften parched skin. The tapioca starch and Kaolin clay are rich in minerals that detox, exfoliate, tighten, tone, and condition the skin, without drying out. Extracts of Pumpkin Seed and Comfrey cleans the pores, controls oil production, supplies essential fatty acids, and is naturally astringent, improving skin tone. Japanese Green Tea acts as an antioxidant to reduce redness and irritation. This mask is so gentle that it can be used two to three times a week. A gentle exfoliation mask that leaves skin soft, smooth, glowing and renewed without redness or a burning sensation. You will feel a slight tingling to the skin as the mask is applied and the actives begin to work. This mask is for all skin types including oily, combination, dry, normal skin and even some sensitive skin. It lightens discoloration, dark spots, hyperpigmentation, and uneven skin tone, and it renews the appearance of aging skin. The mask helps control blemishes, while tightening and reducing pore size, fine lines and wrinkles. Intended for all ages, 17 and up. Recommend using alongside Skin 2 Skin products for best results. Apply a thick layer of creamy masque all over the face and neck. Avoid the eye area and hair line during application. Allow to set for 15 to 20 minutes. Remove with a warm wash cloth starting at the neck up. Rinse wash cloth as needed to remove mask entirely. Enjoy the fresh smooth feeling! Apply moisturizer or other products as usual. Not recommended for sunburned skin and/or extremely sensitive skin. Papain Cabomer Conjugate – A special active enzyme linked papain from papaya fruit that functions as an exfoliator, skin softener and moisturizer and help fight breakouts. It is very effective in skin renewal and skin lightening. It is an antioxidant that combats free radicals, thus preventing premature aging. The papain stays active in our cream-based formulation unlike the power versions. Pumpkin Seed Extract – Cleans and renews the skin because it contains a great amount of skin-friendly antioxidants vitamins A and E, mineral zinc and selenium to control blemishes and oil production, essential fatty acids. Tapioca Starch – Tightens and tones the skin and helps deliver key ingredients, antioxidants and nutrition to the skin. Kaolin Refined Clay (White Volcanic Clay) – The mildest of all clay’s, removes dead skin, detoxifying by drawing impurities from the skin without stripping it of its natural oils. Reduces facial puffiness, is mineral rich, and has calcium, zinc and magnesium for blemish control. Avocado Oil – Quickly and naturally absorbed into the skin providing protein, omega 3, vitamins A, b2, D, E, and K, potassium and lecithin that softens and reduces age spots. Camellia Oleifera (Japanese Green Tea) Extract – Not only a powerful antioxidant, rich in vitamins C and E, that brightens, tightens and rejuvenates, also reduces skin irritation and redness. Symphytum Officinale (Comfrey) -Has soothing, firming and tightening properties. Helps reduce the appearance of fine lines and wrinkles, effective for oily skin and good for sensitive skin.